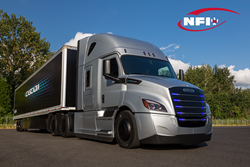 NFI, a leading supply chain solutions provider, will partner with Daimler Trucks North America (DTNA) in their Freightliner Electric Innovation Fleet to operate its new electric vehicle model, the Freightliner eCascadia™. About NFI – NFI is a fully integrated North American supply chain solutions provider headquartered in Cherry Hill, N.J. Privately held by the Brown family since its inception in 1932, NFI generates nearly $2 billion in annual revenue and employs more than 10,000 associates. NFI owns facilities globally and operates 41.5 million square feet of warehouse and distribution space. Its dedicated and drayage fleet consists of over 4,000 tractors and 8,900 trailers. Its business lines include dedicated transportation, distribution, transportation management, port drayage, intermodal, brokerage, global logistics, and commercial real estate. For more information about NFI, visit http://www.nfiindustries.com or call 1-877-NFI-3777. About Daimler Trucks North America – Daimler Trucks North America LLC, headquartered in Portland, Oregon, is the leading heavyduty truck manufacturer in North America. Daimler Trucks North America produces and markets commercial vehicles under the Freightliner, Western Star and Thomas Built Buses nameplates. Daimler Trucks North America is a Daimler company, the world’s leading commercial vehicle manufacturer. About Freightliner Trucks – Freightliner Trucks is a division of Daimler Trucks North America LLC, headquartered in Portland, Oregon, and is the leading heavy-duty truck manufacturer in North America. Daimler Trucks North America produces and markets Class 5–8 trucks and is a Daimler company, the world’s leading commercial vehicle manufacturer.